By now, it is fairly clear that the iPad Mini has been cannibalizing sales of the 9.7" iPad. Even though the iPad Mini has been a success on a standalone basis, it stands to reason that it should be called a success only if it has boosted revenues (and hence, profits) for Apple, after taking cannibalization into account. Let's take a look if that is the case. 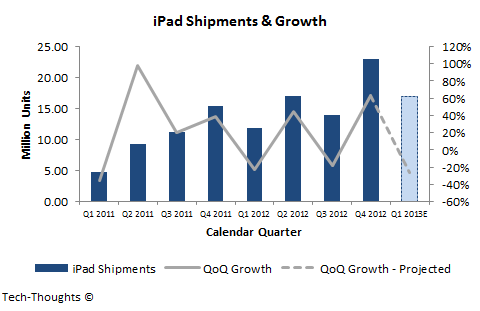 The iPad's revenue growth, much like the iPad's shipment growth, is remarkably cyclical and has remained consistent for the past 5-6 quarters. 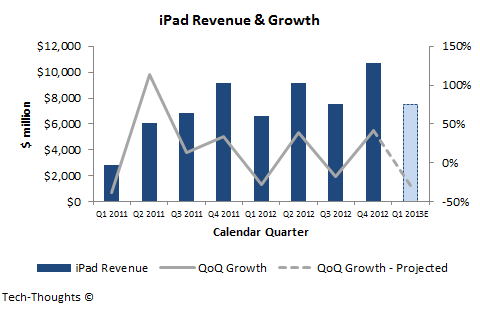 iPad revenues over the past few years have peaked in the product launch quarter (Q2) and in the holiday quarter (Q4), while remaining weak in the other quarters. The iPad's sequential revenue growth in Q4 2012 (after the iPad Mini launch) basically matched that from Q2 (after the 3rd gen iPad launch). For Q1 2012, using my iPad shipment forecast of 17 million and a 5% decline in ASP (as the product mix continues to shift towards the iPad Mini), the $7.5 billion revenue forecast matches Q3 2012 revenue and the Q1 2013 sequential revenue decline matches that from Q1 2012. Based on previous forecasts, this suggests that revenue from the iPad Mini has merely replaced revenue from cannibalized 9.7" iPads. However, Apple has stated that the iPad Mini's margins are lower than those on the 9.7" iPad. This implies that the introduction of the iPad Mini has had a neutral impact on revenues and consequently, a negative impact on profits. In fact, given these figures, it seems that the only scenario in which the iPad Mini could be deemed a success is if previous iPad forecasts (including mine) were over-optimistic and had not taken rising tablet competition into account. Given recent figures from research houses like IDC and NPD, that scenario may very well be unfolding.